At last… on our way east! We were away a little earlier today. The Admiral pointed out that the longer we stay somewhere, the longer it takes to get going. Sure enough, after a 3 night stop it took us till 9:15 to get on our way. Much better than the 10:45 getaway from Benson after 8 days! I got this look at the hills to the NW as I waited for the Admiral to finish the mini-walk with the dogs. 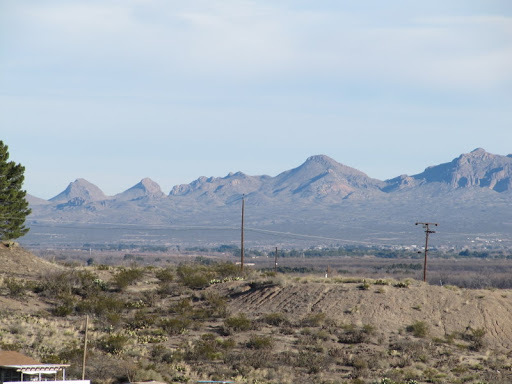 The trip from Las Cruces, NM to Van Horn, TX could have been much better were there a way to avoid El Paso. This is perhaps our 3rd time thru here and the traffic is no better. And, even though I had thought it impossible, the smog is even worse than last time. But, like a root canal, it was eventually over and we felt better. 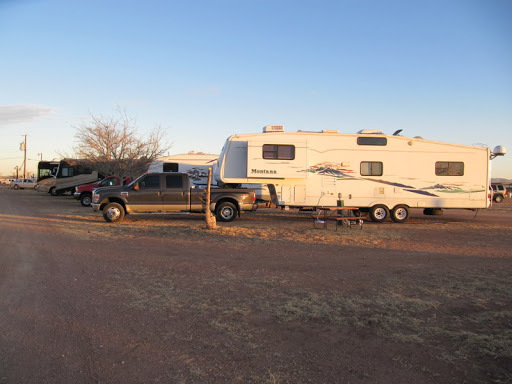 Van Horn KOA… every site is a pull-thru! Here we are in Van Horn, TX, all connected and ready for din-din. I asked an employee at the Las Cruces campground what I was going to find in Van Horn besides the KOA Kampground where we’re parked for the night. He said “It’s kind of like an oasis.” I asked “Really? It’s that good?” “No… it’s more like the only thing that isn’t desert. Nice little town, but there’s not much around there.” He was right on the money, but it’s still a nice stop for a weary driver and the campground is very easy to get in and out: every site is a pull-thru. Actually, we’re not very weary as we only had a 175 mile day. Tomorrow’s trip to San Angelo, TX will be our longest so far while towing- close to 300 miles. Some might think us wimps, but we’ve arbitrarily set 250-300 miles as our daily limit. In preparation for a fast getaway we haven’t unhitched. While it’ll be convenient in the morning, it means the trailer rocks & rolls. When the dogs scratch at their harness, the whole floor leaps around like a California earthquake. The KOA here in Van Horn has a small cafe which is why we didn’t have to unhitch. We had dinner last nite and breakfast this morning. Van Horn is definitely not a luxury resort, but this was pretty darn close! This entry was posted in Uncategorized and tagged El Paso, KOA, Van Horn. Bookmark the permalink.